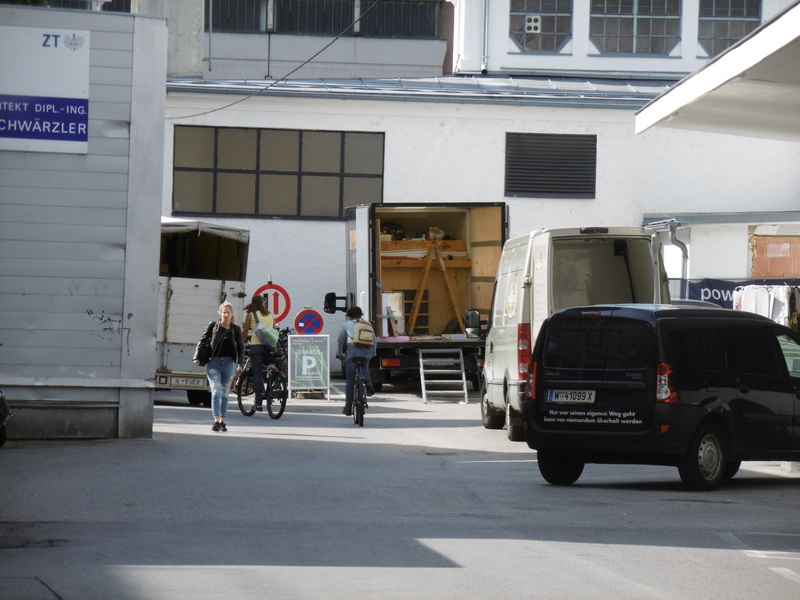 around the Markthalle, Innsbruck. The official sign makes the changes look very orderly. 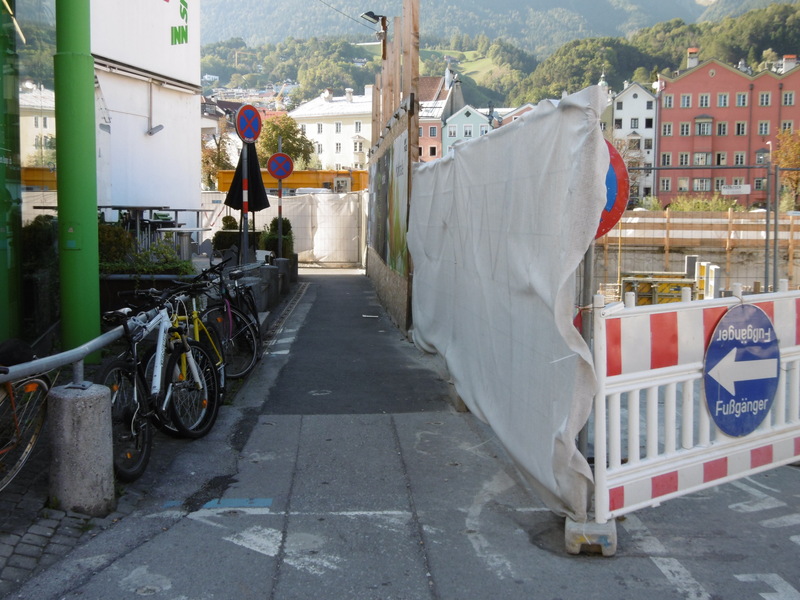 However, the temporary path is only a meter wide and contains two right-angle turns, so is not of much use to cyclists. 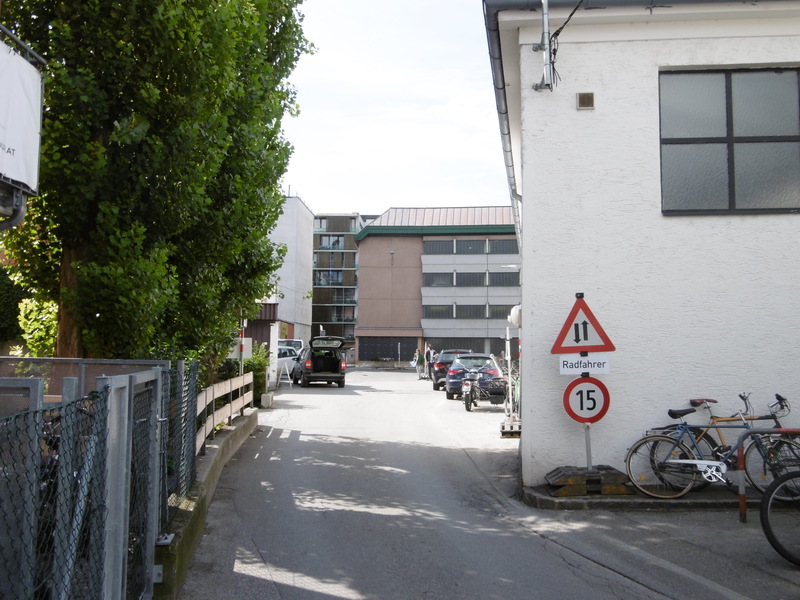 With the river at our right and the connection to the city at our left, we look down the two-lane road with adjacent parking behind the Markthalle. Everything looks good, but what is that in the distance? 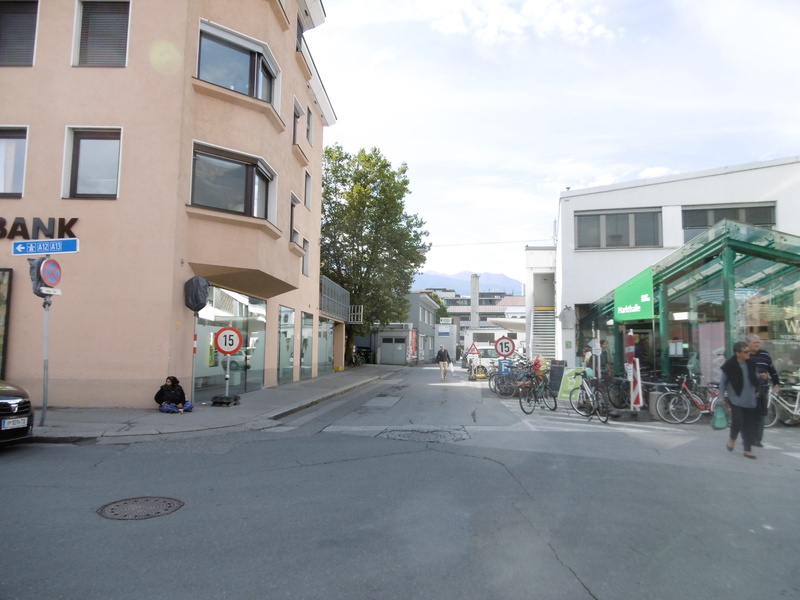 Proceeding forward, we see the problem: One of the buildings on the city side juts out from the left, and the Markthalle juts out from the right, so there is actually no straight road behind the building. 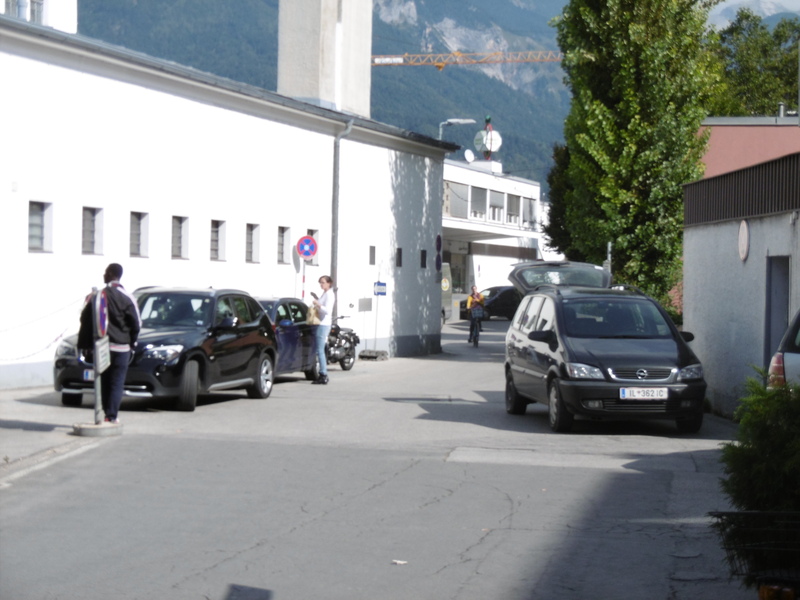 Through the space between the building on the left and the store-room on the right move cars, delivery wagons, pedestrians, and cyclists in both directions. 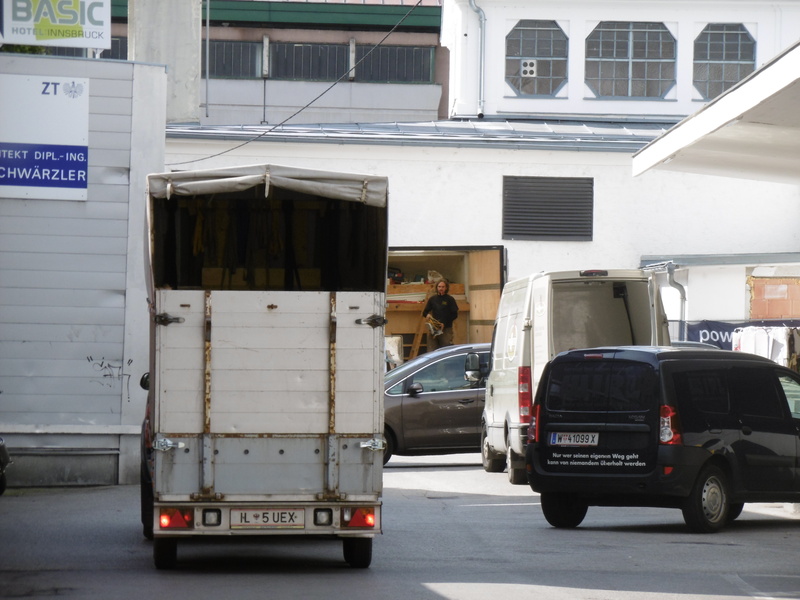 Not only that, but on the side with the loading docks a panel van has parked and a carpentry workshop has been set up inside. Sometimes ten-wheelers come through here. Between the warehouse and the yards and hotels next door, the passage narrows to about four metres wide. Because of the ‘dogleg’ in the alley, it is impossible to see the oncoming traffic until just before the narrows. 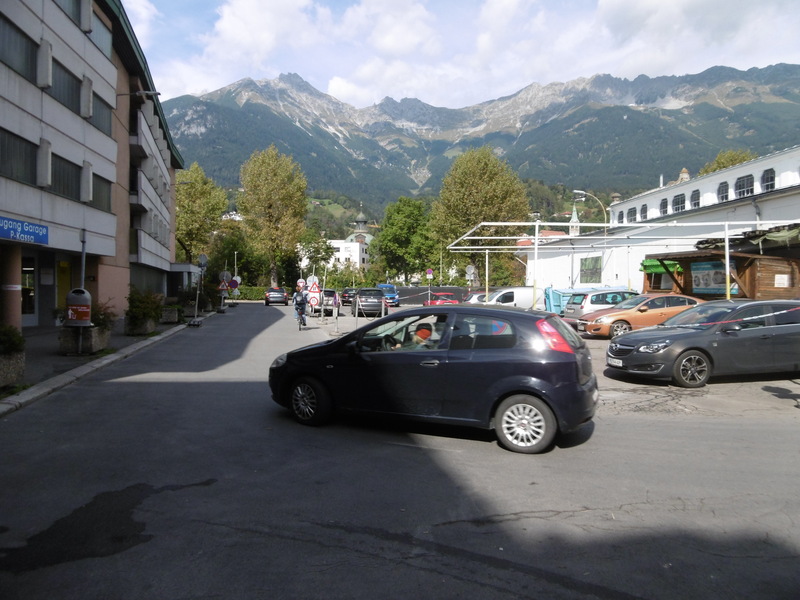 Through the narrows and looking back, we see some of the many cars which park here for convenient access to the Markthalle and the shops, apartments, bars, and barbers on the side away from the river. The people with their backs to traffic and opening car doors must add an exciting spice to the lives of delivery drivers who have just come around the corner. The cars entering and leaving the small parking lots on the right certainly do! 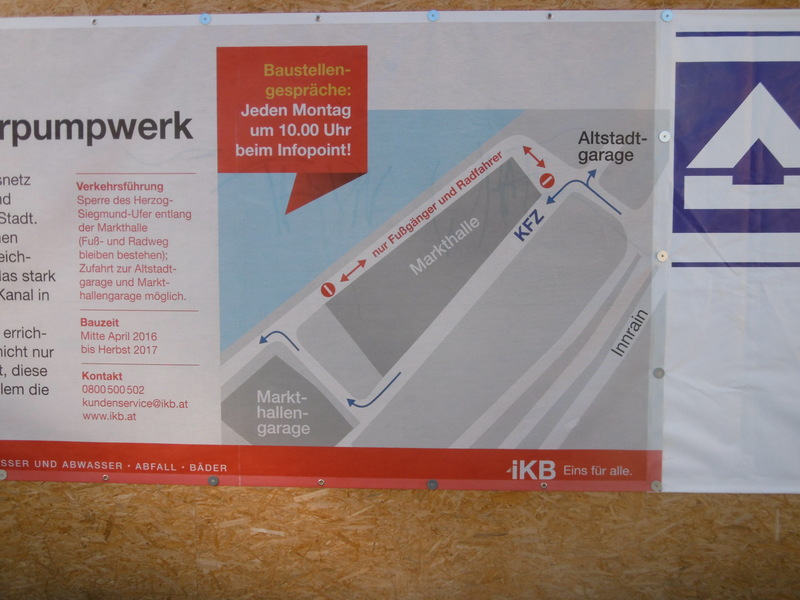 On the other side of the Markthalle the road widens to three or four lanes between a parkade and a parking lot. The parkade opens directly onto the river road just where people leaving after the alley have to turn, and one of the vans with food for the homeless often sets up here.